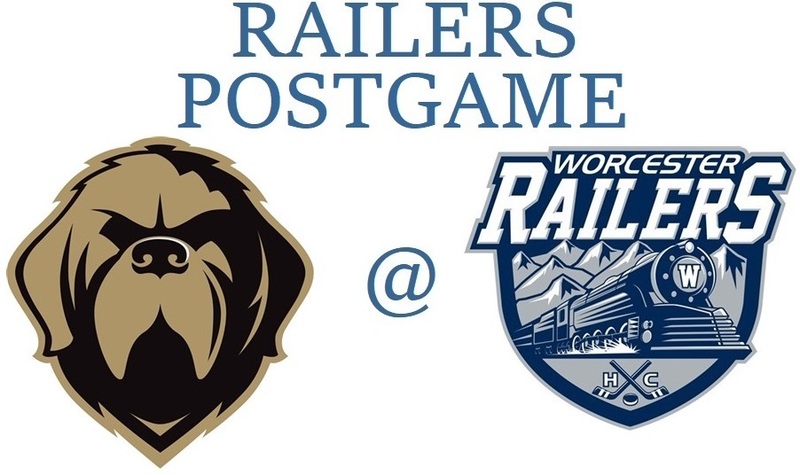 The Worcester Railers took on the Newfoundland Growlers Saturday night in a game that was just about pride with the Railers being eliminated from the ECHL playoff race Friday night and the Growlers having long since clinching first place in the ECHL’s North Division. It ended up being one of the best games played at the DCU Center all season. It didn’t start out looking that way as just 1:45 into the contest Worcester defenseman Ryan MacKinnon was unable to make an outlet pass, and has happened a lot this season the turnover ended up in the Railers net. Ryan Moore was the Growlers player that collected the turnover, and after a pass Gabriel Gagne blasted the puck wide of the goal. It bounded off the end boards right to Semyon Der-Arguchintsev, who made a goal scorer’s shot from a tough angle that went over the left shoulder of Worcester goaltender Mitch Gillam and just inside the far post. Newfoundland would make it 2-0 at 8:43 on the power play when J.J. Piccinich put a rebound of a Brady Ferguson shot past Gillam. Railers defenseman Tyler Mueller had lost his stick and the Growlers took advantage by playing the puck toward him. With no stick to defend with Mueller ended up out of position, and Piccinich was able to get between him and Gillam to easily grab the rebound. The Railers would get one back at 11:47 when Josh Holmstrom broke into the Growlers zone and fired one high over the net. Matt Schmalz grabbed the bounding puck over by the right wing boards, and fed a pass to Nick Sorkin streaking into the zone. Sorkin went to the net and flipped a pass to Holmstrom, who was also heading toward the cage. Holmstrom then fired a spin-o-rama shot that Newfoundland netminder Eric Levine had no chance on. A bad bounce would give the Growlers their two goal lead back when Evan Neugold fired a hard shot on goal that was blocked by Worcester defenseman Ivan Chukarov. The puck bounded a long way to the stick of Giorgio Estephan, who fired it back on net using MacKinnon as a screen. Gillam didn’t have enough time to react to the shot at 12:56, and it was 3-1. That should have been it for Gillam as Railers Head Coach Jamie Russell sent in Blake Wojtala to replace the struggling netminder, but just a few moments later Mike Cornell crashed into Wojtala and the rookie netminder was down for a few moments. Staff ran toward the dressing room to get Gillam back to the bench, but after being tended to by trailer Rob Tagle Wojtala stayed in the game. Gillam stayed standing in full gear where the back-up usually sits for the remainder of the period. Gillam was back between the pipes to start the second period, with Wojtala not in the bench area. There was just one goal in that second frame, and it belonged to the Railers when Tyler Barnes had the puck behind the Newfoundland net and threw a perfect centering feed to Tommy Kelley in the slot. Kelley doesn’t get many bids like that one, but he buries most of the ones he gets and this time was no exception as he made it 3-2 at 7:47. Ryan Hitchcock had the secondary assist. The crowd of 5,515 was just waiting to explode in the third period, and they got their chance at 2:35 when newcomer Ross Olsson got the Railers back to even. The play began with Olsson chasing down Gagne behind the Growlers net. Olsson threw a nice check on Gagne, forcing a bad pass that Chukarov intercepted. Chukarov fired it on net, and his shot hit Olsson as he went to the front of the cage. Olsson then accidentally stepped on the puck and tumbled to the ice right in front, but the puck stayed within reach and he swept it into the net to make it 3-3. The scoresheet lists MacKinnon as having the lone assist, but it belongs to Chukarov and will likely be changed. Worcester controlled the play for most of the third frame, and their hard work paid off with the eventual game winner at 16:47 when Sorkin wheeled the net and threw the puck out in front of the Newfoundland goal. Dylan Willick got a piece of it, but not enough to have a great bid on it. The puck ended up at the far post where Kelley banged it home for his second of the game and the 4-3 lead. Nothing has come easy for the Railers all season, and the final few moments of the game were no exception as Newfoundland pulled Levine for the extra attacker, followed by a few moments later Mueller being called for a slash to give the Growlers a six on four advantage. The Worcester penalty killers were great over that remaining 1:45, but nothing matches what Willick did in the last few moments of that game. After having already blocked a shot earlier Willick then blocked another, this one an absolute blast by Growlers defenseman Sam Jardine. The momentum of the puck still carried it deeper into the zone, where Willick chased it down and stole it from Gagne. Willick was then high-sticked by Gagne and went down along the boards. As played continued with no penalty call, he got back up managed to tie the puck up long enough in the corner for Newfoundland to be unable to get another legitimate scoring chance. Scratches for the Railers were Evan Buitenhuis (14-day IR/lower), Drew Callin, Matty Gaudreau, Kyle McKenzie (14-day IR/season), Tommy Panico (14-day IR/season), Rob Powers, Yanick Turcotte (suspended/game 1 of 2), and Alex Vanier (14-day IR/upper). Blake Wojtala was the back-up goaltender and entered the game at 12:56 of the first period, and soon after he was run into by Mike Cornell. Wojtala finished the period but did not return for the second or third, and was not on the bench. Word after the game was Wojtala had taken a knee to the head and was held out as a precaution. He should be good to go on Sunday. The fallout from Friday night’s game against Maine came down quickly from the ECHL, as Yanick Turcotte was suspended for two games as a result of his boarding major and game misconduct. After multiple views of the video this writer doesn’t feel even a minor penalty should have been called, much less being suspended for it. Amazingly Brycen Martin, who cross-checked Mike Cornell into the boards from behind long after the final horn sounded, was also suspended for two games. A quick look at previous suspensions involving majors and game misconducts after the game had ended shows Martin should have gotten at least four games, and six games was the standard for players that had already been suspended that season. The Railers have three skaters wearing full face shields on the roster, and an informal poll of some longtime Worcester hockey fans seems to point that this may be the first time a team from the city has had that many players wearing the full face shields. Defenseman Connor Doherty has one to protect an orbital bone after taking a puck under his visor February 10th against Cincinnati, eventually missing eight games. Matt Schmalz is wearing one after a jaw injury that took place on January 25th when he was jumped by Thunder defenseman Michael Sdao. Schmalz was out for 20 games and has yet to find the offensive form he showed before the injury. Ryan Hitchcock started wearing one Friday after taking a skate up high after a face-off on Wednesday and needed eight stitched in his lower lip to close the cut. On this day, April 7th, in Worcester hockey history: in 2007 the WorSharks got two goals and two assists, including an overtime game winner at 1:39, in their 7-6 win in Binghamton against the Senators. Garrett Stafford tied the game with a six on four goal with 28 seconds left in regulation as Stafford ended the contest with two goals and an assist. Worcester’s other goal scorers were Torrey Mitchell, Josh Prudden, and Scott Ferguson. Mitchchell also chipped in two assist while Mathieu Darche had three helpers. Thomas Greiss earned the win in goal…in 2010 the WorSharks scored five third period goals on their way to a 9-2 clubbing of the Wolf Pack in Hartford. Brandon Mashinter led the team with two goals and an assist. T.J. Trevelyan also had two goals in the contest. Danny Groulx, Cory Quirk, Dan DaSilva, and James Marcou all added a goal and an assist, while John McCarthy also had a goal. Derek Joslin and Justin Braun had three helpers each, and Ryan Vesce had two. Alex Stalock earned the win with 24 saves…in 2015 Ryan Carpenter scored the only goal of the game at 2:03 of overtime to give the WorSharks a 1-0 win in Portland. Joakim Ryan and Eriah Hayes had the assists on the goal, and Aaron Dell made 30 saves for his fourth shutout of the season…in 2018 the Railers got a third period game winner from T.J. Syner to beat the Monarchs in Manchester 3-2. Dylan Willick and Dwyer Tschantz had first period goals for Worecster, and Will King made 25 saves for the win. 1st Period-1, Newfoundland, Der-Arguchintsev 1 (Gagne, Moore), 1:45. 2, Newfoundland, Piccinich 9 (Ferguson, O’Brien), 8:43 (PP). 3, Worcester, Holmstrom 14 (Sorkin, Schmalz), 11:47. 4, Newfoundland, Estephan 20 (Neugold, Pooley), 12:56. Penalties-Cornell Wor (holding), 3:47; Almeida Wor (high-sticking), 8:30; Pardy Nfl (slashing), 17:02. 3rd Period-6, Worcester, Olsson 2 (MacKinnon), 2:35. 7, Worcester, Kelley 6 (Willick, Sorkin), 16:47. Penalties-Melindy Nfl (holding), 6:25; Mueller Wor (slashing), 18:15. Shots on Goal-Newfoundland 12-9-10-31. Worcester 12-8-9-29. Power Play Opportunities-Newfoundland 1 / 3; Worcester 0 / 2. Goalies-Newfoundland, Levine 4-4-1-3 (29 shots-25 saves). Worcester, Gillam 20-16-2-3 (30 shots-27 saves); Wojtala 1-4-1-0 (1 shots-1 saves). Linesmen-Guillaume Brunelle (73), Shane Kanaly (39).